The pedagogical community celebrates the 100th anniversary of an outstanding teacher and studies both in the last century and now. Pedagogical readings conducted by the teachers of our school, testified that V.O. Sukhomlynsky is modern and up-to-date. 1. V.O. Sukhomlynsky – teacher, philosopher, wise man. 2. Humanistic Principles of Pedagogy V.O. Sukhomlynsky. 3. Realization of tasks by inheritance V.O. Sukhomlynsky. 4. Forms of work with children of school age. 5. Works by V.O. Sukhomlynsky for teachers and children. 6. The system of Sukhomlynsky’s requirements for the activities of the teacher. 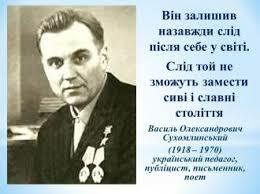 The Ukrainian and world pedagogical community highly appreciates the contribution of V.O. Sukhomlynsky in the development of education and science. A well-known teacher, 23 years inevitably worked as director of Pavlitsky secondary school. Work at school was the most fruitful period of his scientific-practical and literary-journalistic activities. He turned ordinary village school into a real pedagogical laboratory, where he extracted treasures of pedagogical wisdom. According to Vasyl Sukhomlynsky, the school is not a storehouse of knowledge, but a candle of mind, a sanctuary and hope, a spiritual cradle of the people, a futile child of society. It is the world of human emotional touches, the concentration of good feelings, subtle experiences. It is an eternal hearth of beauty, education and enlightenment. At school, the child carries out one of the most important periods of his life, and not only the acquisition of knowledge, skills and ways of doing business. Vasyl Olexandrovych is the author of 48 monographs, over 600 articles, 1500 stories and tales, parables and short stories for children. His most famous work – “I give my heart to children”, translated into 30 languages ​​of the world, was re-released 54 times. In general, the works of V.O. Sukhomlynsky is published in 53 languages ​​of the world with a circulation of almost 15 million copies. His books are mainly devoted to the education and training of young people, the teaching of parents. In 1955, Vasyl Olexandrovych defended his Ph.D. thesis on the topic “Director of the school – the head of the educational process”. V. Sukhomlynsky is not only a writer, but also a corresponding member of the Academy of Pedagogical Sciences of the RSFSR, since 1958 – Honored Teacher of the Ukrainian SSR. In 1968 he was awarded the title of Hero of Socialist Labor. In the same year he was elected a corresponding member of the Academy of Pedagogical Sciences of the USSR. 1) The upbringing of the child should be aimed at the cultivation of its needs. 2) The ideal of the cultural desires of a person who needs to be brought up – the needs in labor, in the creation of goodness, in beauty. 3) To raise a child, you must create sensitivity to education (need to be good) in him, create for his “joy of being”, form a sense of self-esteem. 4) The condition of successful education, from which it should begin, is to create an atmosphere of success, which is the basis of its foundation. Absolute advantage of positive stimuli and reactions to the behavior of the child over negative. Each generation in a new way perceives V. Sukhomlynsky, finds valuable guides for education and upbringing. to disappear with the unknown pylon.